Running is one of the world’s most popular forms of exercise. Upwards of 40 million people run regularly and more than 10 million people run at least 100 days per year in the US. Although running is an effective way to achieve many health benefits, it is associated with a high risk of injury. Every year, up to 50% of all runners report an injury due to overuse. Read on for more information on how these injuries occur, as well as how to treat and prevent them from derailing you running goals. Patellofemoral pain syndrome (PFPS) is the irritation of the cartilage on the underside of the patella or kneecap. Risk factors include overpronation (excessive inward foot rolling) and weak muscles around the hips and knees. In order to decrease pain, taking extra rest days and reducing your mileage is necessary. Avoid running downhill, which can exacerbate pain. Biking, swimming, and the elliptical may speed up your recovery by strengthening the quads. A stress fracture is a small crack in a bone that typically affects runners in the hip, shin and even the feet. It’s often due to repetitive motions such as running and jumping. The pain gets worse with activity and improves with rest. Rest is important, as continued stress on the bone can lead to more serious injury. If you experience a “clicking” or “catching” feeling and have intermittent pain from a recent hip twist or fall, you could have a cartilage tear. Tears in cartilage of the knee or hip are usually caused by trauma. Stop running and see a sports medicine specialist if the joint has a pain, swelling, and a sudden decreased range of motion, all hallmark signs of a cartilage tear. If you experience lateral knee or hip pain and most of your running is done on the road or track, your hip pain could be caused by Iliotibial Band Syndrome, which is irritation of the “ITB” that runs down the outside of the thigh from the hip to the shin. The ITB can be irritated by always running on the same side of the road or the same direction on the track, running too much too soon, tight hip or knee muscles, or wearing unsupportive shoes. Change your route or alternate directions on the track, stretch your hamstrings and ITB, and replace your shoes to treat and prevent progression of this all too common injury. So how can one prevent these common running injuries from sidelining them? Stretching plays a useful role in the management of common running injuries. In a study of 900 military recruits, those who stretched regularly experienced lower rates of low back and soft tissue pain. As far as “warming up” is concerned, there is insufficient quality research to determine whether warming up reduces injury rates in runners. Although debate continues regarding the role footwear plays in runners, it is important to wear a shoe best suited to the runner’s foot type in order to prevent injury. Common types of shoes are those with cushioning for runners with high arches, neutral shoes for those with an adequate arch, and shoes for those with a low arch (over-pronators) that are designed to minimize foot motion. Additionally, optimal nutrition does enhance performance and recovery. It is important to consume adequate calories, carbohydrates, protein and healthy fats. Lastly, runners should drink before, during, and after exercise as water loss of as little as 2 percent body mass can decrease performance. Weigh yourself before and after a run and drink 16 to 24 ounces of fluid for every pound lost during exercise. Don’t let your injuries go without taking proper care of them. When in serious pain, it is important to see a professional. 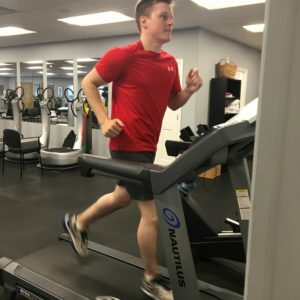 The Physical Therapy team at Monmouth Pain & Rehabilitation can work with you to get you back into your running routine if something is stopping you. Call 732-345-1377 or fill out the form on this page to make an appointment. It’s that time of the year again to dust off the skis and hit the slopes. In recent years, ACL injuries have become quite prevalent in Alpine skiing. An injury to the ACL can result in an unstable knee, which may lead to expensive surgery. This can also cause a lengthy period of rehabilitation in order for the skier to resume an active lifestyle. The good news is that a little education can go a long way to minimize the risk involved, and you can be a weekend warrior without the hospital visit. The anterior cruciate ligament (ACL) is the main ligament that connects your thigh to your shin bone and keeps your knee stable and shin in place. While there are three other ligaments that provide knee stability, the focus here is on the ACL due to its high prevalence of injury. According to (Majewski 2006), approximately 20,000 skiers become injured each year. There are various ways in which this injury can occur. The most predominant cause of this injury results from an innocuous, slow, and twisting fall backwards. The other most common way to injure the ACL is when a person falls while his or her foot is stuck in the ski and binding. This results in the skis becoming twisted which places adverse strain on the ACL. Following a few simple suggestions can help you to avoid ACL injuries during ski season. Ensure that you are physically ready for the slopes. 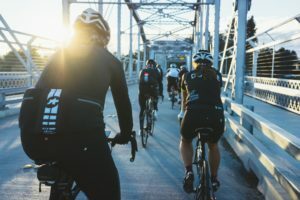 As you begin to fatigue, follow proper technique and take breaks as needed. Avoid potentially dangerous situations altogether – there is nothing wrong with sticking to the nicely groomed trails and powder and steering clear of the obstacle park! Try to land on your side; do not try to break the fall with your arms. If your skis are still moving, your knees are at risk. Do not try to get up until you have completely stopped sliding. You can always get your equipment back afterwards. 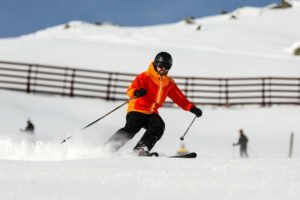 Injuries on the slopes occasionally occur, but taking the necessary precautions will help prevent injuries and keep you healthy on the slopes all season long. The physical therapists at Monmouth Pain and Rehabilitation in Shrewsbury and Wall Township are experienced in working with patients to prevent, treat and rehabilitate ACL injuries. To learn more about MPR’s comprehensive physical therapy treatment program call 732-345-1377 or fill out the form on this page. Dr. Nichole Chaviano graduated from the University of Delaware in 2010 with a BS in Exercise Science with a concentration in Physiology and a minor in Strength + Conditioning. While at UD, she had the opportunity to work with many Division 1 athletes as a Strength + Conditioning intern, not only in the weight room but also in a rehabilitation setting. She went on to attend Rutgers University, where she received her Doctorate of Physical Therapy degree in May 2015. What are the most common hockey injuries you have seen? Knee & Hip injuries- from ACL and other ligamentous injuries and injuries of the meniscus, as well as pulls, strains and tears of the groin and hamstrings to fractures of the lower leg. Ankle & Foot injuries including ankle sprains, Achilles tendinitis and ruptures and blisters. Shoulder, Head & Spine injuries including Concussions, whip lash, neck strains, Rotator cuff sprains/tears, shoulder dislocations & separations, disc herniations and fractures. 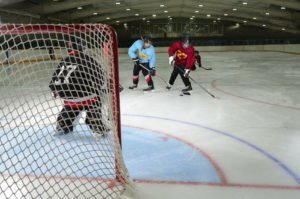 Do you have any tips for preventing Hockey Injuries? Wear appropriate, fitted equipment. This may include helmets, pads, mouth guards, and fitted skates. In addition to appropriate equipment it is especially important for athletes to be physically prepared for sport, with sport specific strength and conditioning. Athletes should also participate in pre-testing for concussion management. In the event an athlete sustains a head injury having the pre-injury data helps to drive treatment and return to sport protocol more safely and quickly. What should an athlete do if they are injured? Depending on the extent of the injury the athlete should be cleared of any immediate risk of bleeding or fracture by MD. Once cleared they should see a Physical Therapist for treatment to safely and quickly return to the rink. At MPR this can include some of the latest technology including ImPact ™ Concussion testing, and Game Ready ™. All of our therapists create individualized treatment plans including the use of sport specific equipment including slide boards, airex and BOSU ™ balance training systems and Power Plates ™. To learn more about the physical therapy program at Monmouth Pain and Rehabilitation call us at 732-345-1377 to schedule a free consultation ($245 value) at our Shrewsbury or Wall Township location. Chair exercise is mainly geared for those who are at an increased risk of falling, have severe joint problems, or are wheelchair-bound. Exercise is important for people of all ages and fitness levels because it increases strength, flexibility and blood circulation while improving your mood! 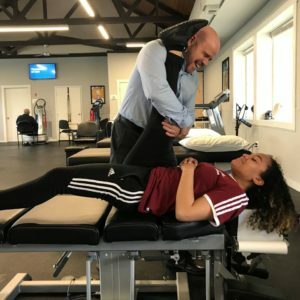 MPR Physical Therapy Assistant, Amy Ramos, demonstrates three full-body chair exercises that involve both the upper and lower body as well as core muscles. If you are trying to get back to a healthier version of yourself we are here to help. The physical therapists, chiropractors, acupuncturists, massage therapists and physicians at Monmouth Pain and Rehabilitation are experts in helping individuals throughout their lifelong journey of vibrant health. 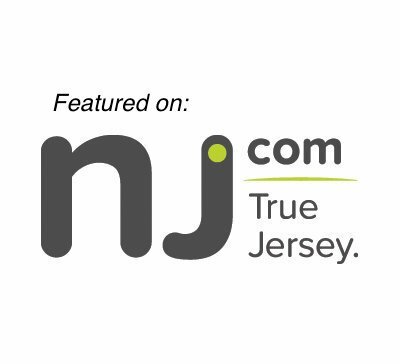 Contact us at 732-345-1377 or fill out the form on this page to learn how we can help you. Learn how Posture can cause Headaches, Vision Issues & Pain! Filed under Chiropractic, Physical Therapy. Does your back ache throughout the day? Many people who spend their work day at a desk or behind the wheel of a vehicle accept back pain as part of their job description but it does not have to be. Postural syndrome, also known as ‘Poor Posture Syndrome,’ results from the body being positioned with compromised posture for extended periods of time. If you sit in a slouched position your back is in the same position it would be in if you were to bend over and touch your toes. This is the ‘maximal bend’ of your back and places a considerable amount of pressure on the joints in your back. This prolonged stretching on the back naturally causes aches and pain. Postural Syndrome typically exhibits itself in pain and dull aches throughout the back, the area between the shoulder blades and the neck. Typically, the pain is the most severe while the body is in the anatomically incorrect posture while sitting, standing or lying. Over time, functioning with poor posture can also result in compromised neck strength, reduced range of motion, scar tissue and misaligned joints. Fortunately, postural syndrome can be effectively treated with holistic therapies. Treatment goals typically focus on relieving pain, restoring balanced muscle strength, reestablishing full range of motion and establishing ergonomically correct posture. Monmouth Pain and Rehabilitation is a multi-disciplinary facility comprised of medical doctors, chiropractors, physical therapists, acupuncturists and massage therapists experienced in treating postural syndrome. If you think you might be suffering from postural syndrome contact Monmouth Pain and Rehabilitation today to eliminate aches and pains from your day to day. Call 732-345-1377 or visit www.MonmouthPain.com to schedule a free consultation ($245 value) in Shrewsbury and Wall Township, NJ.